© 2017 Souled Out Exploration Co.
Every day, a long line of black ants marches hopelessly skyward. They climb to the top of a great hill, disappear behind it, then momentarily reappear to make their way back down. The ants have nothing to gain, yet every day this process repeats itself. 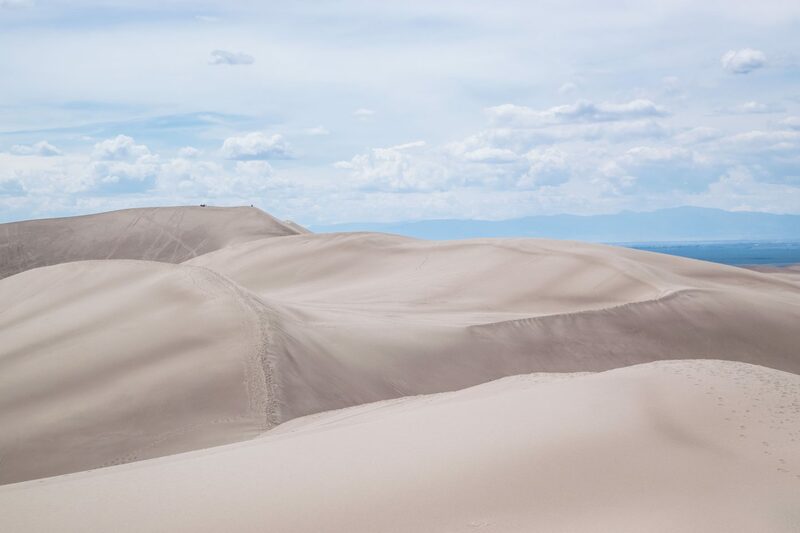 It happens at Great Sand Dunes National Park, only the ants aren’t bugs—they’re people. And the ant hill is a towering sea of sand dunes that scrapes 750 feet up from the valley floor. Seen from afar, these dunes are dwarfed by nearby Rocky Mountains. Seen up close, they dwarf all who oppose them. We—myself, Jeff and Karen—have come to the Great Sand Dunes for a challenge. Jeff is challenging his body after recovering from a serious motorcycle accident. I am challenging the summit after failing to reach the peak of Mount Whitney. And Karen is challenging the world, because that’s what Karen does. Together, we crossed the rippling stream that forms the dunes’ eastern boundary and headed towards the top. To reach it, you have to navigate a maze of shifting, red-hot sands that will at times place you against vertical walls, steep ravines and the whipping winds of a natural sandblaster. And you have to do it all at over 8,000 feet. We can’t see the top at all. It’s too high. For miles, each dune climbed feels like the crest of a great hill. “Surely,” I begin to think, “this is the last one.” But the last one doesn’t come quickly or easily; in fact, the last one is simply code for the tallest one—the one that will give us a clear view of the never-ending field of crests stretching for miles in either direction. Jeff is the shutterbug of the group. He takes a thousand pictures, though he’s probably been here a thousand times. Jeff loves life, and it shows. Karen and I trudge forward, shoes digging holes in the sand. No worries—the wind will soon cover them up again. We blaze our own trail, finding hidden meadows and life and vistas in the sand. We sing shoddy versions of the Rocky theme song as we top what we think is the summit. (It wasn’t.) But, a few ridges later, we do reach the peak, and the view is…incredible. Karen draws the letters. I pour the water. And we take a few photos to give back to you, the people who read this blog and follow this journey and believe in a single, black ant criss-crossing the country on his own. From afar, it probably looks like a journey in vain. From inside, it sometimes feels like it. But it’s moments like this that make me remember what it’s all about: climbing, growing, facing goals and winning challenges. It’s moments like this that remind me of the other ants, millions of them, climbing mountains and facing personal challenges all across the world every day. So here’s to you, ants. From the one on top of the hill today, I look forward to watching you hit the summit in your own, weird ways. When my home was sold out from under me, I bought a tent and decided to live outside. Now, I'm a freelance writer for Travel Channel, INSIDER, Nat Geo, and Fodor's Travel and I'm on a never-ending quest to get out of my comfort zones and see the world.